Watch out! It’s a Vampire Moth! It is common knowledge that insects like butterflies and moths do not feed on blood, or at least not on human blood, like mosquitoes do. However, a couple of years ago, scientists have discovered a species of blood feeding moths which are similar to the Siberian moths; the Calyptra thalictri,. Scientists believe that this is an evolutionary behaviour that has developed from traits like feeding on tears and pus filled wounds (Roach, 2008) . But why do they feed on blood? As seen in the video, research has shown that these moths only exhibit this trait under experimental conditionals. In other words, they only exhibited feeding of blood in an non-natural environment. Therefore, whether this behaviour occurs under natural conditions is unknown. It is also interesting to note that this blood feeding behaviour is only seen in males. Scientists have hypothesised that males engage in such behaviour because of a deficiency in nutrients like salt. 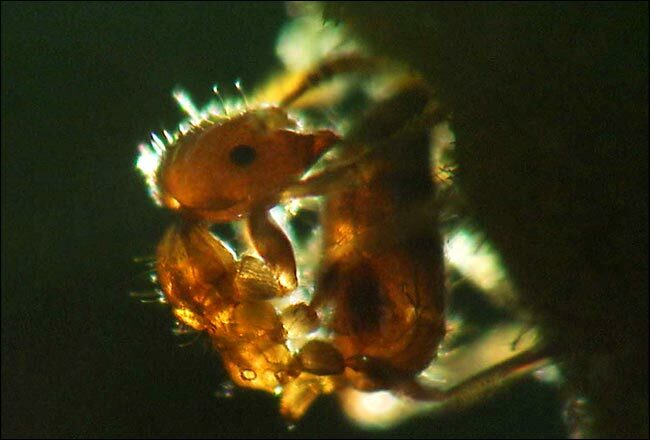 It is also believed to be a ‘sexual gift’ since salt is passed to the females during copulation. According to the Entomologist Jennifer Zaspel, this sexual gift would give a nutritional boost to the young (Roach, 2008). Calyptra thalictri are common in the regions of Malaysia and southern Europe. So the next time we head to Malaysia, do we need to bring bags of garlic to ward off these potentially blood sucking moths? No, not so much. Apparently,these moths are not believed to be transmitters of disease and hence are not considered as a threat to humans (Simpson, 2008) . But nothing is certain as of now as research is still underway to learn more about these moths. This evolutionary process of the moths got me thinking. If Man keeps destroying nature, this type of insects and many others will naturall evolve into blood feeding creatures because of the lack of food. If that happens, what else can Man do then wipe out these insects? Let’s hope this evolutionary process does these insects more good than harm. “Vampire Moths Discovered” by National Geographic. YouTube Channel, 18 November 2008 URL: http://www.youtube.com/watch?v=x2VQZc8PebA&feature=fvst (accessed on 28 March 2010. Zaspel, J. M., Kononenko, V. S., & Goldstein, P. Z. (2007). Another Blood Feeder? Experimental Feeding of a Fruit-Piercing Moth Species on Human Blood in the Primorye Territory of Far Eastern Russia (Lepidoptera: Noctuidae: Calpinae). Journal of Insect Behaviour , 437-451. Here his mate is injured and her condition is fatal. 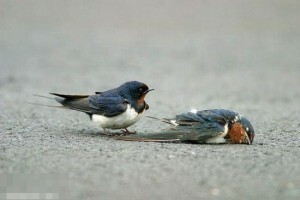 She was hit by a car as she swooped low across the road. He brought her food again but was shocked to find her dead. 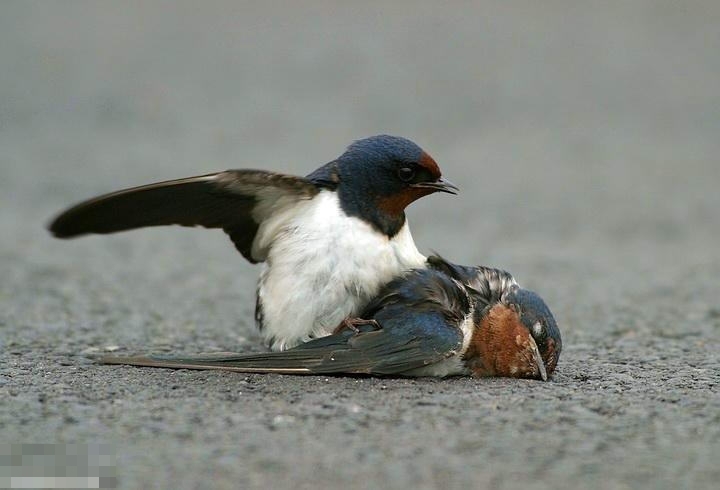 He tried to move her … a rarely-seen effort for swallows! 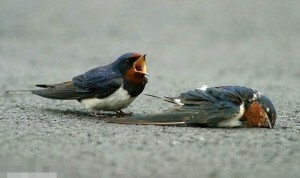 Aware that his sweetheart is dead and she will never come back to him again, he cries out with adoring love. He stood beside her calling for her return and saddened by her death. Finally aware that she would never return to him, he stood vigil beside her still body with sadness and sorrow. The story you just read was sent to me through email by a friend. It was taken by a photographer who sold these pictures to a newspaper in France, and has been spreading over the Internet like wildfire. Unlike many today, that swallow (it seemed) was true to the words, ‘till death do us part’ that he might have ‘cheeped’ on the altar. Yet, the question you are probably asking is, does it apply for all swallows or is this just one of the few soon-to-be-extinct species of Mr. Rights that female Homo sapiens dream of every night? Mr. 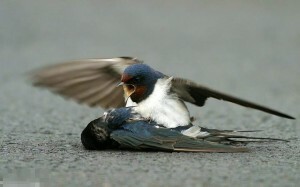 Right (the swallow) is a H. r. rustica, a subspecies of Barn Swallow, scientific name Hirundo rustica. His species is usually found in Europe and Asia. Studies show that barn swallows do copulate with non-mates, thereby leading to copulation with non-mates and multiple paternity of a single brood (Ford 1983; McKinney et al. 1984), especially so in a large colony. As a result, male mates like Mr. Right, tend to engage in mate guarding as a measure against extra-pair copulations (EPC), thereby making sure his wife does not go around making love with any other male that decides to drop by their nest. This is especially so for young unmated males (aka players), who benefit from EPC since they are not bound to a nest. Besides EPC, males also engage in frequent within-pair copulations to keep out competitors keen on a one-night stand with their wives (Møller, 1987). Barn swallows as we can see are thus socially monogamous, especially for the males. For the females, they remain monogamous, until a more attractive male arrives and give reasons such as a longer outermost tail feather, tempting enough for them to turn polygamous. So, what about Mr. Right? Studies on how animals and emotions is scarce, with animal psychology still in its infancy, and feelings being something is that very little studied since it is hard to observe and that a common language have yet to be found between homo sapiens and swallows, so interviews cannot be conducted yet. However, through the behaviors of Mr. Right I believe we can make an intellectual guess (as did the photographer) on how he felt at the death of his spouse, when we link that to how we homo sapiens would feel in the same scenario. However, deeper reasons such as whether Mr. 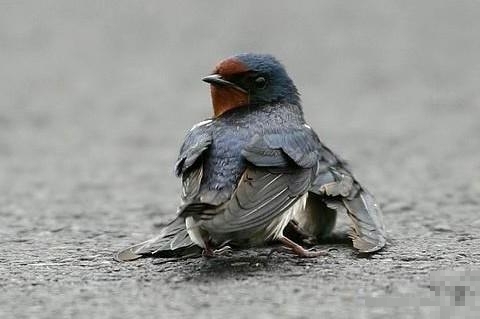 Right is feeling sad over the loss of a loved one or whether the death of his wife meant that he will have the trouble of finding another wife at his age, would however remain undisclosed till researchers find a way into understanding the tiny swallow’s heart. Anders Pape Møller, 1987. 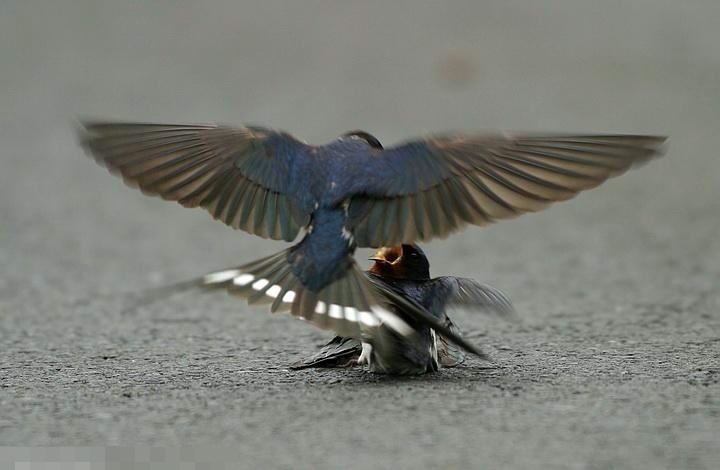 Advantages and disadvantages of coloniality in the swallow, Hirundo rustica. Animal Behaviour, Volume 35, Issue 3, Pages 819-832. Ford, N. L. 1983. Variation in mate fidelity in monogamous birds. In: Current Ornithology. Vol. 1 (Ed. by R. F. Johnston), pp. 329-356. New York and London: Plenum Press. Mating Systems (Ed. by R. L. Smith), pp. 523-545. Orlando: Academic Press. Moller AP, Tegelstrom H., 1997. Extra-pair paternity and tail ornamentation in the barn swallow Hirundo rustica. Behavioral and sociobiology, 41(5): 353-360.